I am experiencing a life-sized version of “my eyes are bigger than my stomach” which has been a common theme throughout the course of my existence. Bigger, busier, and faster is better even if each task involves major procrastination and panic. I blame my parents. They made me. When my brain is on overload I typically retreat and try to solve the issue(s) by putting each task in its own private bucket, if you will. Days are buckets. Today I will do homework. Tomorrow I will study while running on the treadmill. The day after that I will completely finish the project at work which has enveloped my life. This works in theory until your buckets are filled with life-enveloping tasks, to dos, and last minute additions. This is when sheet pans come in handy. Dinner on a sheet pan. How convenient. I get to rub some chicken, cut some vegetables, throw it all on a single sheet pan, toss it in the oven and “voila”… dinner is done, man. And the carrots in this recipe are home grown, baby. They are heirloom cosmic purples with purple skin and orange/yellow flesh. Cosmics are spicier than the regular orange carrots you can find at the grocery. I pulled them, cleaned them, and cooked them just for you. Root vegetables: Cut each sweet potato and carrot in half lengthwise, then lengthwise in to four thick wedges (the size of potato wedges). Place in a large bowl; season generally with salt and pepper. Drizzle in oil, and using your hands, toss to coat. Spread vegetables in a single layer on a large roasting pan or large rimmed sheet pan. Sprinkle with a hint of paprika and cinnamon. Preheat oven to 475 degrees. Place chicken breasts side by side right on top of the root vegetables. Top with sprigs of thyme. 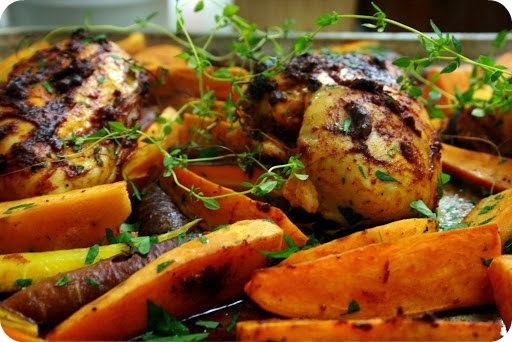 Roast chicken and vegetables for 20 minutes. Remove from oven; turn vegetables, rearranging chicken breasts if necessary. Reduce heat to 425 degrees. Continue roasting chicken and vegetables until the juices run clear; about 20 minutes. Let rest for 5 minutes before serving. HINT: the smaller your chicken breasts, the smaller you should cut your vegetables. You want them to cook evenly. To serve: Transfer root vegetables on to a large platter. Sprinkle with fresh parsley. Arrange breasts on top of vegetables. Put a few sprigs of fresh thyme on top for color. You just described my life perfectly. But if my hair isn't on fire, I'm bored. I'll never learn. Definitely need to find some cosmic carrots. I bet their spiciness was awesome with the cinnamon you added. I found some cosmic carrots at my local organic grocer yesterday. It's rare to find them until the fall. Gotta try em. so good! Thanks for stopping by! It was certainly tasty and a good stand by for busy nights. Love that top pic! This is perfect fall food! If this is what you create when you are busy, well then, here's to pressure! Yum. This is my kind of food, Grub. Do make time for yourself tho!